Summary of Assignments: After OCS, he was assigned to the 1st Battalion, 36th Infantry in Germany. 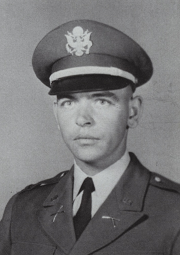 He spent two tours in Vietnam, both with MACV, as an advisor to the 7th ARVN Division. He was wounded during one of his tours. He got out of the Army and later rejoined at the rank of E-5. He retired in 1984 after 25 years as a Major. He was up for LTC in the Reserves and E-8 in the Active Component but decided to retire rather than go back to Germany. After Retirement: In the words of Ron’s wife Phyllis R. Barnes. “Our plan for retirement was to get a travel trailer and Suburban and take in the sights at our own pace and choosing. We had a wonderful, happy 10 years. We fulfilled our dreams. I could go on forever with our adventures. In 1994 we decided to buy a home in our hometown of Hamilton, Ohio, near family, as we had met several people who were full time travelers and when one got sick and could no longer travel they had nowhere to go. We moved here in 1994 and one thing lead to another and we never left, and traveled no more. We gained a wonderful Grandson, Kaleb (now 16) and have enjoyed him more than words can say. We have two sons, Duane of Hamilton, Ohio and Ricky of Seattle, Washington. in 1997 we had a friend, who was also a Vet, and who had his own ice cream company. On a trip to Washington, D.C. for a Veteran’s Biker’s Rally he had a serious accident on the beltway. He called Ron and asked if he could drive his truck and keep his route going until he could mend. That was the start of a whole new career. Ron became “Papa Ron,” the ice cream man for 12 years and loved it. He was able to serve kids and then see them grow up and he served their kids. There was always at least one funny kid story at the end of each day.